Welcome back to Messier Monday! We continue our tribute to our dear friend, Tammy Plotner, by looking at Messier 6, otherwise known as NGC 6405 and the Butterfly Cluster. Enjoy! This Catalog would go on to become a major milestone in the history of astronomy, as well as the study of Deep Sky Objects. Among the many famous objects in this catalog is M6 (aka. NGC 6405), an open cluster of stars in the constellation of Scorpius. Because of its vague resemblance to a butterfly, it is known as the Butterfly Cluster. This coming weekend presents the first window for 2013 to complete a challenge in the realm of backyard astronomy and visual athletics. With some careful planning, persistence, and just plain luck, you can join the vaunted ranks of those seasoned observers who’ve seen all 110 objects in the Messier catalog… in one night. 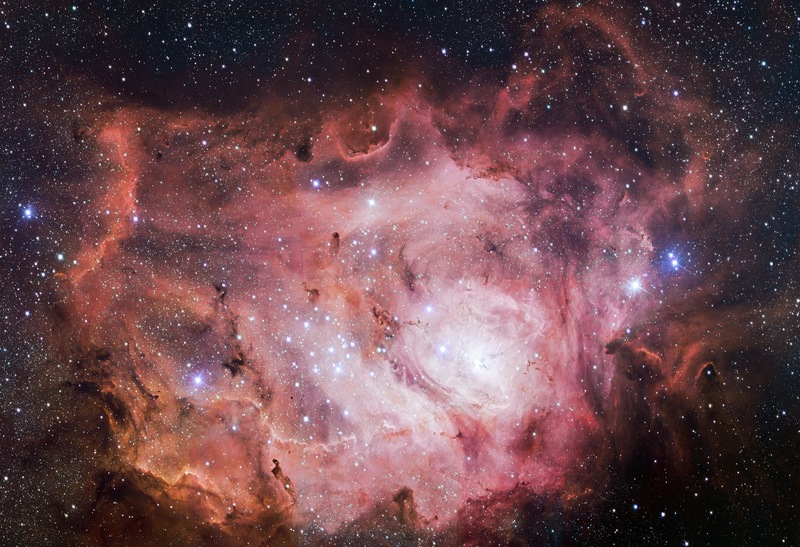 Observing all of the objects in Messier’s catalog in a single night has become a bit of a sport over the last few decades for northern hemisphere observers, and several clubs and organizations now offer certificates for the same. The catalog itself was a first attempt by French astronomer Charles Messier to catalog the menagerie of “faint fuzzies” strewn about the northern hemisphere sky. Not that Charles knew much about the nature of what he was seeing. The modern Messier catalog includes a grab bag collection of galaxies, nebulae, open and globular clusters and more down to magnitude +11.5, all above declination -35°. Charles carried out his observations from Paris France at latitude +49° north. Unfortunately, this also means that Messier catalog is the product of Charles Messier’s northern-based vantage point. The northernmost objects in the catalog are Messiers 81 & 82 at declination +69°, which never get above the horizon for observers south of latitude -21°. His initial publication of the catalog in 1774 contained 45 objects, and his final publication contained 103, with more objects added based on his notes after his death in 1817. (Fun fact: Messier is buried in the famous Père Lachaise Cemetery in Paris, site of other notable graves such as those of Chopin and Jim Morrison). M51, the Whirlpool Galaxy, one of the more photogenic objects in the Messier catalog. (Credit: NASA/Hubble Heritage Project). There’s a fair amount of controversy on Messier’s motivations and methods for compiling his catalog. The standard mantra that will probably always be with us is that Messier was frustrated with stumbling across these objects in his hunt for comets and decided to catalog them once and for all. He eventually discovered 13 comets in his lifetime, including Comet Lexell which passed only 2.2 million kilometres from Earth in 1770. 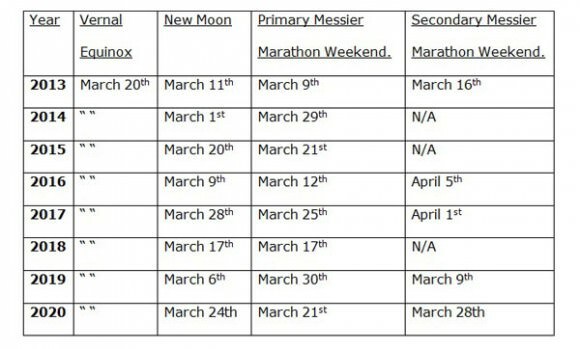 Optimal Messier marathon dates for the remainder of the decade. (Compiled by author). Note that this year’s weekend is very nearly the earliest that it can occur. The optimal latitude for Messier marathoning is usually quoted as 25° north, about the latitude of Miami. It’s worth noting that 2013 is one of the very few years where the primary weekend falls on or before our shift one hour forward to Daylight Saving time, occurring this year on March 10th for North America. Students of the Messier catalog will also know of the several controversies that exist within the list. For example, one wide double star in Ursa Major made its way into the catalog as Messier 40. There’s also been debate over the years as to the true identity of Messier 102, and most marathoners accept the galaxy NGC 5866 in its stead. Optics of the day weren’t the most stellar (bad pun intended) and this is evident in the inclusion of some objects but the omission of others. For example, it’s hard to imagine a would-be comet hunter mistaking the Pleiades (M45) for an icy interloper, but curiously, Messier omits the brilliant Double Cluster in Perseus. It’s vital for Messier marathoners to run through objects in proper sequence. Most visual observers run these in groups, although Alex McConahay suggests in a recent April 2013 Sky & Telescope article that folks running a photographic marathon (see below) beware of wasting precious time crossing the celestial meridian (a maneuver which requires a telescope equipped with a German Equatorial mount to “flip” sides) hunting down objects. The unspoken “code of the skies” for visual Messier marathoners is that “Go-To” equipped scopes are forbidden. Part of the intended purpose of the exercise is to acquaint you with the night sky via star hopping to the target. Most observers complete Messier objects in groups. You’ll want to nab M77 and M74 immediately after local dusk, or the marathon will be over before it starts. You’ll then want to move over to the Andromeda Galaxy and the collection of objects in its vicinity before scouring Orion and environs. From that point out, you can begin to slow down a bit and pace yourself through the galaxy groups in Coma Berenices and the Bowl of Virgo asterism. Another cluster of objects stretch out in the sky past midnight along the plane of our Milky Way Galaxy from Sagittarius to Cygnus, and the final (and often most troublesome) targets to bag are the Messier objects in Aquarius and M30 in Capricornus just before dawn. Remember, dark skies, warm clothes, and hot coffee are your friends in this endeavor! There have been alternate rules or versions of Messier marathons over the years. Some imagers complete one-night photographic messier marathons. There are even abbreviated or expanded versions of the feat. 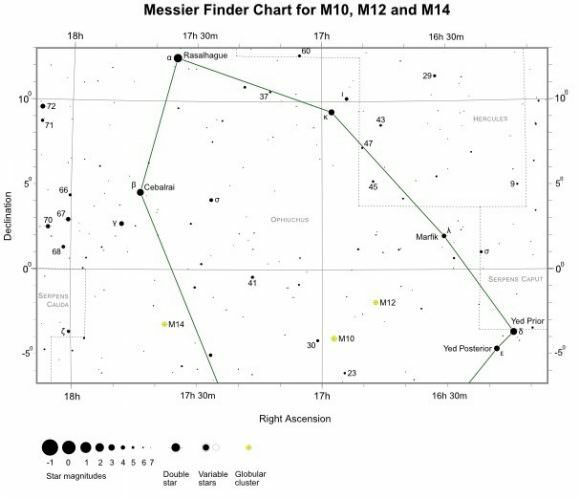 It is also possible to nab most of the Messier catalog with a good pair of binoculars under clear skies. Probably the most challenging version we’ve heard of is sketching all 110 Messier objects in one evening… you might be forgiven for using a Go-To enabled telescope to accomplish this! Finally, just like running marathons, the question we often get is why. Some may eschew transforming the art of dark sky observing into a task of visual gymnastics. We feel that to run through this most famous of catalogs in an evening is a great way to learn the sky and practice the fast-disappearing art of star hopping. And hey, no one’s saying you can’t take a year or three to finish the Messier catalog… its a big universe, and the New General Catalog (NGC) and Index Catalog (IC) containing thousands of objects will still be waiting. Have YOU seen all 110? – A perpetual listing of Messier marathon visibility by latitude by Tom Polakis. – An All Sky Map of the Messier catalog. – A handy priority list for a Messier marathon compiled by Don Machholz. Well, Tammy’s done it again. Remember the Universe Today Guide to the Constellations? Well now Tammy has completed another monster volume. The Universe Today Guide to the Messier Objects. This is a guide to all 110 Messier Objects, from M1 (the Crab Nebula) to M110 (a satellite galaxy to Andromeda), and everything in between. In addition to descriptions of the individual Messier Objects, there’s also a nice introduction to the Messier Objects, a guide to doing a Messier marathon, and suggestions for stretching your Messier marathon out to a week. If you’ve got any questions, comments or feedback, please let us know. I’m sure there are going to be some bugs in there. Thanks. And thanks again to the wonderful Tammy Plotner for grinding through this monster project. P.S. If you want to use any part of this information for any reason whatsoever, you’ve got my permission. Be my guest. Print them off for your astronomy club, turn it into a PDF and give it away from your site. Republish the guides on your own site. Whatever you like. All I ask is that you link back to Universe Today and the specific page, so people can find out where it came from.